There are many folk who don’t seem to know that you can grow fantastic Dahlias from seed…really really easily. The great advantage is that for less than a fiver you can have a hundred of the little blighters Dahliaring all over your garden. Then next year you can have a hundred different sort doing the same thing. I love the ones that look like 1950’s swimming hats and so with this in mind I am selling a Dahlia Cactus Mix and I also love the super iconic flowers of Dahlia Coltness which you will also find in the shop. Both these dahlias are amongst the best you will find for using in the vase and will produce hundreds and hundreds of blooms for you to pick…or leave…as you choose. shall be growing both these in the Higgledy garden this year and will be posting my progress. If you have any questions just pop them in the comment box below and I’ll get back to you. 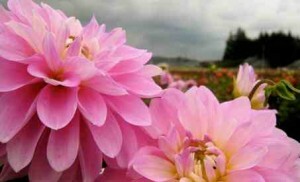 How to grow Dahlias from seed. *I sow mine in three inch pots or modular trays are even better as the slugs don’t have anywhere to hide…grrrrr…pesky slugs. *Fill your pots with compost…preferably peat free. *I sow between mid March and Mid April, this gives the chaps around six weeks to get going until the last frost date for my region, which is the 15th May here in Cambridge. *Gently push the seeds under the surface of your compost, cover and water gently. *Pop the tray into a greenhouse, coldframe or onto a windowsill. *When you get to mid May, take them outside during the day and bring them in at night, this is called ‘hardening them off’…acclimatising them effectively. 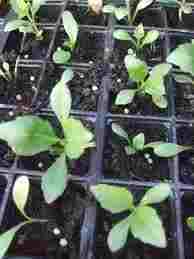 *Plant them out after the frosts. If you get a wicked and naughty late frost then you MUST cover your Dahlias with…well anything you’ve got! Horticultural fleece is good and not too expensive…but I’ve used Sainsbury’s plastic bags before and they’ve been fine. *Plant in a sunny spot and leave a space of a foot between plants. *They should flower from 12 weeks of sowing. The Higgledy Garden Shop will be open from Friday 20th January. See you there! Cleome Spinosa. Spider Plant. Annual Asters. I planted my annual Dahlias too early and the frost damaged them a bit, will they come back? ouch! They ‘may’…but they might be stunted…best leave them be and see if they recover. Best of luck! Hurray for Dahlias. I can vouch for the fact that they are easy to grow from seed and then of course you can overwinter your favourite tubers in a frost-free shed or garage for even bigger plants next year. Brilliant!